There’s nothing particularly original about a police drama built around a lead character who gives his name to the show. But this isn’t Morse, or Bergerac. Luther the show is more a psychological thriller than a cop show, there’s far more emphasis on outwitting people than on chasing them in cars and shooting them. Luther the character is a Chief Inspector in a serious crime team, he’s an extremely good investigator, using intelligence to keep a step ahead of the criminals. Unfortunately he’s not exactly what you’d describe as entirely on the up-and-up. He’s one of those characters with a ‘strong sense of justice’ which is slightly troublesome for a police officer, because sometimes his methods for finding information and evidence won’t exactly hold up in court. The really interesting part of the set-up created for the first season is that although Luther starts off in a mental institution, he’s not nearly as crazy as those around him think he is. He does have a temper, but for the most part he controls it, what others may think is craziness is actually him rationally deciding on a course of action. He has a strange set of cheerleaders on his side however, his new partner who wants to learn from him and believes in him for no particular reason that I can see, his estranged wife, and a murderer that he couldn’t catch. The relationship with his estranged wife is the best developed of the series, possibly even the only relationship that makes any sense. Although there are excellent reasons why they are no longer together, they have a long history and both remember that their relationship used to be good. Even when she is angry with him, she understands him and is firm in her beliefs of what he would and wouldn’t do. Likewise through it all, he wants her to be safe and happy, and he can understand and accept that those two conditions may not be possible with him. To counterpoint that complicated but generally positive relationship is the altogether less healthy connection that develops between Luther and a murderer that he couldn’t catch. Luther seems to respect her ability to elude prosecution and gradually uses her more and more to gain insight from a mind just as sharp as his, but wired an entirely different way. How and why this relationship develops is as much a mystery to Luther as it is the audience, but it really works somehow. The first season is only six episodes long and I wish it had been a couple of episodes longer to give the writers more time to develop the characters and situations more naturally. I would have preferred a couple of episodes where Luther beats the criminals in a fair competition, too often he gives up and declares that there’s no way to catch criminals without stretching the law, the fact that he always feels the need to cheat undermines his supposed intelligence and abilities. More time would have also given more time for the surrounding characters to develop, to really get a feel for the relationships they have with Luther, so that when things get complicated at the end, there’s a firmer starting point. As it was, the acts of betrayal and loyalty didn’t feel as dramatic to the audience as they did to Luther, they just didn’t feel earned. This is far from a perfect series, most of the cases are ridiculously over the top, the writing lays things on a bit thick and many of the characters under-developed. However at its core there’s a very interesting character, played beautifully by Idris Elba (The Wire), he takes the hammy dialogue and does fascinating things with it just in the tone of his voice and the tilt of his head. The show Luther really is all about the character of Luther, and with Idris Elba’s inspired performance, that is more than enough to make me recommend it. The Guardian: Gradually, as the weeks have passed, the audience’s persistence has been rewarded and it has developed into something approaching appointment TV. Yes, Luther’s still an unconventional cop who doesn’t play by the rules and, yes, his personal life is a mess – but that’s not the only substance the programme has to it. 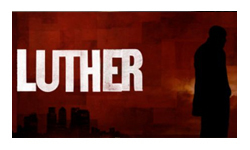 In fact Luther is barely even a cop show at all: it’s a slightly sillier version of Silence of the Lambs. TV Squad: ‘Luther’s’ increasing density and darkness becomes addictive, and it almost does the impossible — it takes that old TV cliche about the detective who may think too much like a criminal and makes it feel fresh again.